We've had our hands on the Dungeons & Dragons Starter Set for a few days now, and while that hasn't been enough time for us to play the entire thing and put together a full review, these are some impressions from reading through it a couple times. It's a decent enough product, with a strong adventure and characters that really cue people into how to play D&D. Composed of two full-color booklets and some pre-printed characters on heavy paper stock, the characters impress but the quality of the booklets is perhaps a little flimsy - though they couldn't be higher quality without really raising the cost of the product. The rules themselves could be more thorough, but are short enough that they could really get played by savvy learners after about an hour. 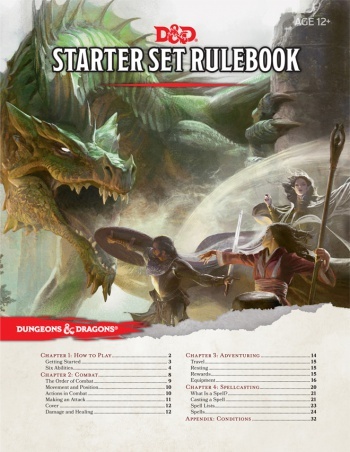 While the D&D Starter Set isn't the comprehensive introductory product some might have liked, it looks like a valuable ground-level intro to the game at a price few can disagree with. These are quite nice, serving as a quick introduction to the essentials of the system without introducing any odd minutiae of rules or corner cases that would frustrate progress for a learner. 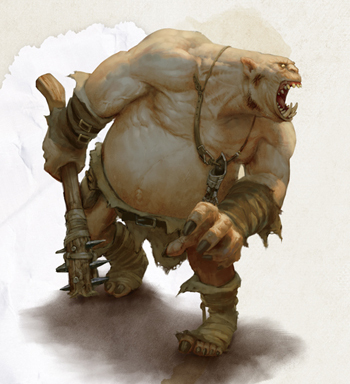 Some notable D&D mainstays like charge actions are absent. A few rules variants - like "inspiration" bonuses for players with good roleplaying - are present, though set aside in sidebars. However, without actually putting these rules in front of someone who has never played before it's hard to see if they can be learned from easily. It's nice to see the presence of loose rules for overland travel forking into the adventure structure, implying that adventuring should be self-directed and concerned with what the players want to do. The short spell list is serviceable, but combat focused, and it would have been nicer to see some magic that shows the diversity of D&D - like a Levitate spell, for example. For a more thorough thoughts on the new rules themselves, check out our first impressions of the free Basic Rules. There are five pregenerated characters: A Cleric, two Fighters, a Rogue, and a Wizard. They're all blank templates, with only class, race, and weapons chosen for them and a pre-set path of new abilities as they level up. They're different races and quite different from each other mechanically, which is great, but the real valuable thing is that each character is nicely tied into the region the adventure takes place in, along with the adventure itself, and thereby gives some basic roleplaying motivations for the presented scenario. Both of the fighters are human, though one is a noble that focuses on melee combat and the other a peasant archer. They feel rather distinct from each other, though they gain many of the same abilities. Either character is mechanically straightforward enough that it could be handed to a new player without thought. The rogue is perhaps the most interesting, with a criminal background and a skillset based around ambushing enemies and dealing with environmental hazards. The cleric is a dwarf with cool flavor, emphasizing the versatility of the cleric as a class and loaded with enough healing powers to get the party through a few mistakes or unlucky dice rolls. The wizard is maybe the disappointing character, with combat-focused spells and a background that actively encourages the player in question to stay out of conflicts with others - fairly disappointing to see that stereotype in the class that everyone would tell you to give to the veteran player anyways. It would have been nice if I felt comfortable with a new player taking the Wizard. The quality of the adventure is quite high, detailing a regional struggle by the adventurers against an unnamed foe called the Black Spider. Though it does take place in the Forgotten Realms, I barely noticed - perhaps because of my own unfamiliarity with the Realms, but more likely because the Realms are such generic high fantasy as it is. After kicking off with a disappointingly generic ambush fight, the plot finds its way to a small sandbox environment with multiple quest hooks and routes to success. Giving the reigns over to the players fairly early on should work well - simply because the characters all have impulses to explore different routes to adventure. There are several miniature dungeons during the extended second act, culminating in the exploration of a bizzarre ruin during the third act with at least three memorable encounters during it. There's some odd typos and mistakes that I found - like boxed read-aloud text describing enemies that aren't listed in the room - but they were few and far between. The adventure's maps are a particular delight and worthy of a callout - they're all by artist Mike Schley and you can check them out online. The Starter Set displays a really satisfying variety of monsters, with some surprises like the Grick and the Wraith making appearances. Everything named is used in the adventure, so there's not surprises for making adventures of your own later, but the relative challenge rating of each monster is included for easy creation of your own later on. The adventure itself includes a hook that the book says you should use to make an adventure of your own - that's awesome to see! In short, I'm pretty happy with the Starter Set and those who've nearly decided on an early purchase can feel safe pulling the trigger - with the caveat that it's clearly an introduction and not a real standalone product. At USD $20, though, can you really complain? Check back in the coming week for a full review once we've had the chance to put it through some actual play.